Check our Compatibility Guide if you want to know if Acrolinx for Office works with your local platform and with your Acrolinx Platform. Normal view in PowerPoint is the best view for using Acrolinx. You can still check your content in Outline View, Slide View, Notes Page, or Master view. 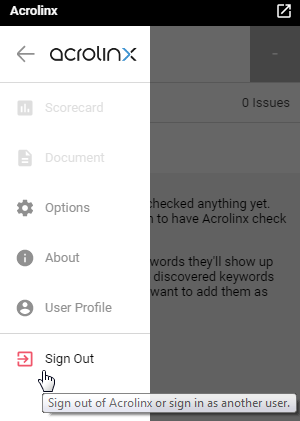 Note that Acrolinx might switch your view, when you click on a Sidebar card. You also might run your check again. The Sidebar won't appear in Reading View. How can I install, update or uninstall Acrolinx? Acrolinx for PowerPoint comes with your Acrolinx for Office on Windows package. To remove Acrolinx for Office, follow the Microsoft Windows procedure for changing and removing programs. Sometimes, Acrolinx checks part of your content but can't highlight the issue or automatically insert suggestions. If you see a padlock in the Sidebar card, you can edit the issue directly in the text. Charts - Note that Acrolinx doesn't check axis labels. You might notice that Acrolinx can’t highlight or replace issues in PowerPoint SmartArt. You can update your Content Profile to fix this. Our support team is happy to help. Acrolinx checks content in speaker notes. But Acrolinx can’t highlight or replace issues in the speaker notes section, if you're connected to an earlier Core Platform version. The cards appear inactive by default. If you want Acrolinx to insert suggestions in speaker notes, you can update your Content Profile. Our support team is happy to help. Select a part of your content. Click CHECK SELECTION in the Sidebar. Note: Check Selection works differently depending on your environment. For best checking results, we recommend selecting whole slides. Acrolinx will check content of one or more slides, without speaker notes. However, you can also select WordArt, SmartArt, Shapes, tables, or headers and footers to check.